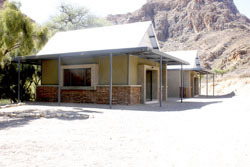 Naukluft Campsite Sesriem accommodation guide everything you need to know before visiting Naukluft Campsite Sesriem Namibia. 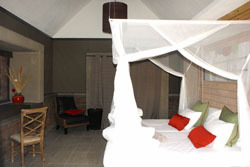 Photographs, room types, activities, facilities, location booking information costs rates and prices for your stay at Naukluft Campsite Sesriem, read all the accommodation information about Naukluft Campsite. 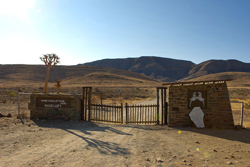 The Naukluft section of the park was created to serve as a sanctuary for Hartmann's mountain zebra, which are endemic to Namibia. Other wildlife includes kudu, gemsbok, klipspringer, duiker, steenbok, leopard, baboon, black-backed jackal, bat-eared fox, African wild cat, caracal and aardwolf. Naukluft's steep cliffs are nesting grounds for various cliff-breeding bird species, including Black eagles. Five different vegetation communities within the park ensure a wealth of tree and shrub species, and a variety of aloes. With its massive and varied rock formations, Naukluft is a geologist's paradise. The intermittent layers of horizontally folded igneous rock, quartzite, dolomite and shale are impressive with their giant symmetrical patterns. 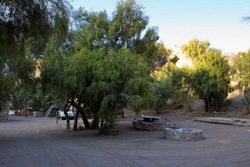 10 x campsites in a gorge alongside a dry riverbed in a beautiful area shaded by trees in the Naukluft Mountains. 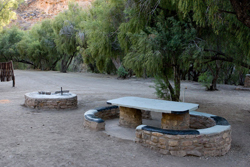 Each campsite has an area to braai/BBQ there is a waterpoint and a clean ablutions block. In a very quiet remote area this small campsite at Naukluft really takes you back to nature and the Naukluft Mountains around you offer wonderful views and exciting walking trails. All around the campsite there are beautiful hiking routes which are a must for nature lovers. 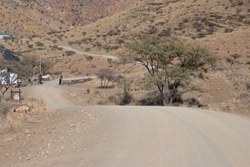 You can choose from two shorter day hikes, the Olive and Waterkloof trails and a 120km trail which takes eight days. An option to hike the first half only, i.e. four days, has been incorporated. The first four days hiking is moderate whilst the last four days are more difficult. Alternatively, the trail can be completed in seven days by combining the last two days (days seven and eight). This should however, be attempted by extremely fit hikers only. This trail must be booked in advance.